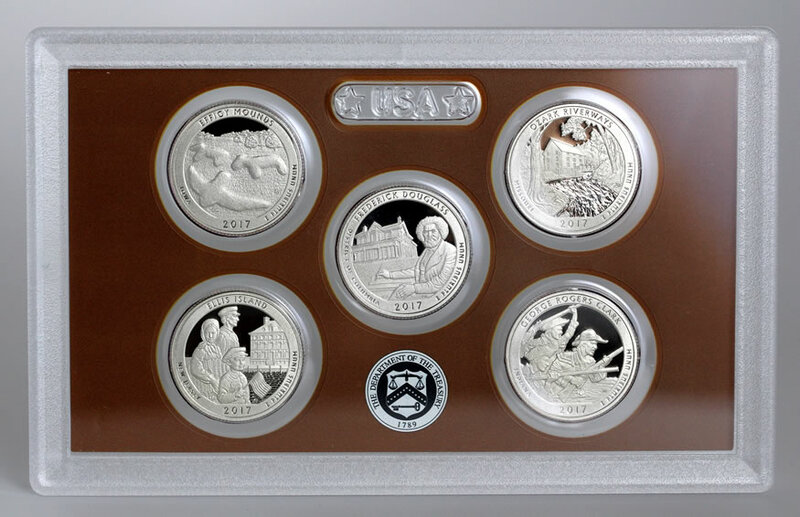 Ellis Island is the latest national site honored in the United States Mint series of America the Beautiful Quarters®. 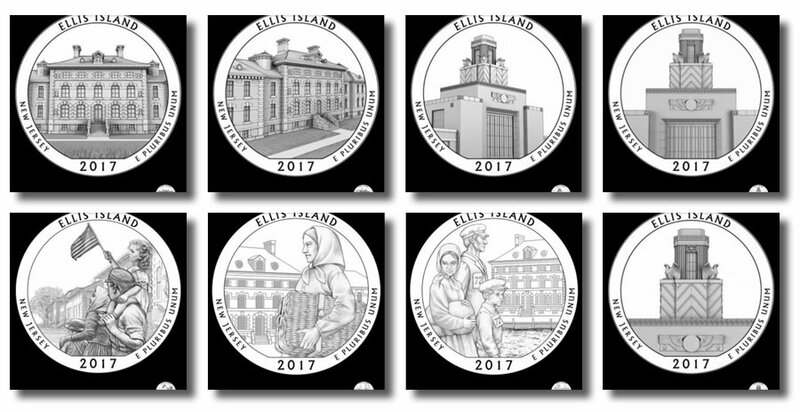 Coins emblematic of the island in New Jersey launched today, Aug. 28, 2017, and are available in rolls and bags. Ellis Island was the most active immigration station in the United States with operations running from 1892 to 1954. For many immigrants, the island was their first stop as they completed an inspection process that lasted on average from 3 to 7 hours. It became part of the Statue of Liberty National Monument in 1965. Ellis Island quarters are the 39th coin of the ATB program and the fourth from the U.S. Mint this year. Available products include 40-coin rolls and 100-coin bags of circulation-quality strikes from production facilities in Philadelphia, Denver and San Francisco. Originally, the U.S. Mint unveiled eight different design candidates for the coin’s reverse (tails side). Individuals charged with reviewing coin designs inspected the candidates, and then the Secretary of the Treasury made the final selection. All America the Beautiful Quarters share an obverse (heads side) portrait depicting George Washington. John Flanagan created this portrait of the first President of the United States and it has appeared on quarter dollars since 1932. Obverse inscriptions read "UNITED STATES OF AMERICA," "LIBERTY," "QUARTER DOLLAR," and "IN GOD WE TRUST." In addition, mintmarks of ‘P,’ ‘D," or ‘S’ show the coin’s production location at the U.S. Mint facilities in Philadelphia, Denver or San Francisco. These coins are in circulation quality finish but have never actually been in circulation. Also, while Philadelphia- and Denver-minted quarters are released into circulation, those produced at the San Francisco Mint are created for numismatic purposes only, such as for these rolls and bags. Flagpole Area. After the ceremony, attendees can swap cash for rolls of the new quarter. There is a coin forum after the ceremony, at 12:30 p.m. These forums allow the public an opportunity to ask questions of Mint officials. It will also take place near the Flagpole Area. 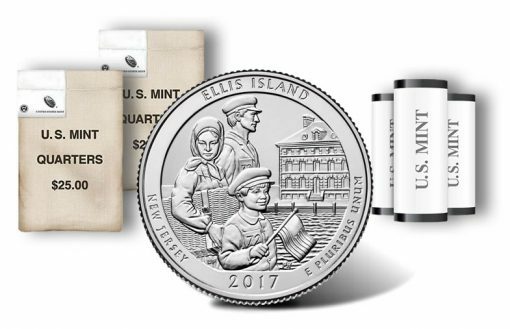 Ellis Island quarter rolls and bags are available from the U.S. Mint’s online store, found here, or by calling 1-800-USA-MINT (872-6468). 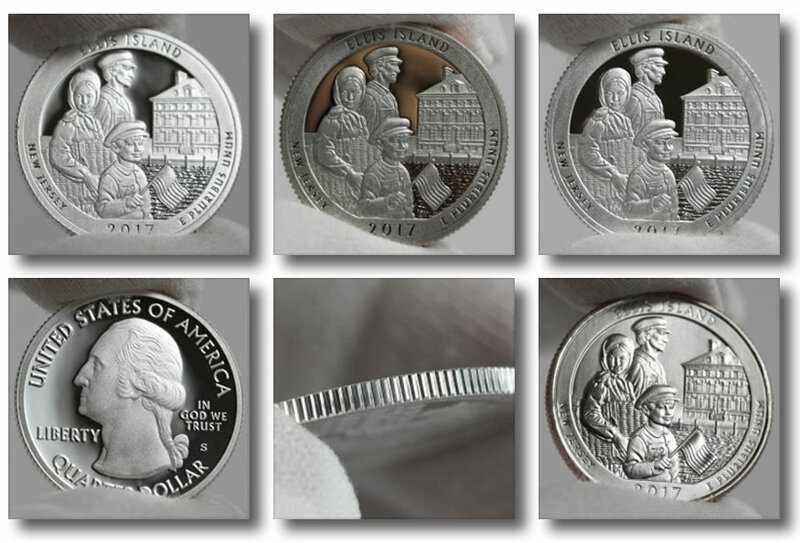 Five different coins appear annually in the program of America the Beautiful Quarters. (See quarters by year.) Previous 2017 quarters honor Effigy Mounds National Monument of Iowa, Frederick Douglass National Historic Site in the District of Columbia, and Ozark National Scenic Riverways of Missouri. Above is a CoinNews photos of the five 2017 America the Beautiful Quarters. These are special collector proof editions from the San Francisco Mint that launched in an annual set earlier this year. In November, George Rogers Clark National Historical Park of Indiana will be honored on the final 2017-dated quarter. Designs found on Ellis Island quarters are also on larger 5-ounce silver coins. This includes bullion strikes sold through the U.S. Mint’s network of authorized purchasers for a premium above the melt value of the silver contained in each coin. It also includes a Philadelphia Mint-struck Ellis Island Five Ounce Silver Uncirculated Coins, which debuts on Sept. 7. The U.S. Mint will sell these uncirculated coins directly to the public for $149.95. Both coins issues are composed of .999 fine silver and have a diameter of three inches.